Persephone is an ancient Greek mythical figure whose story explains why the seasons change. The story is the inspiration behind, “Shooting Persephone,” a 5-minute artistic film about a photo shoot depicting her, with Vancouver photographer Lillian Liu and Seattle-fashion model Caitin Stickels. Some 2,500 years ago or so — (what’s a century between friends?) — Greeks started telling a story that explained why the seasons change. Before the birth of Jesus Christ and the Roman Republic, a monothiestic view of things reigned in classical Greece. Ancient folk believed many Gods ran the universe. One of those Gods was Demeter, the Goddess of Harvest. But a lustful Hades, King of the Underworld, had eyes for her lovely daughter Persephone. While Persephone was collecting flowers, Hades abducted her and dragged her below the earth to make her his bride. She then became the reluctant Queen of the Underworld. When her mother Demeter finds out, she is beside herself with grief. So she goes to the Sun God. ‘Hey Helios — you see everything on Earth, so what happened to my daughter?” But when Demeter hears, “You didn’t know?” she flips out. 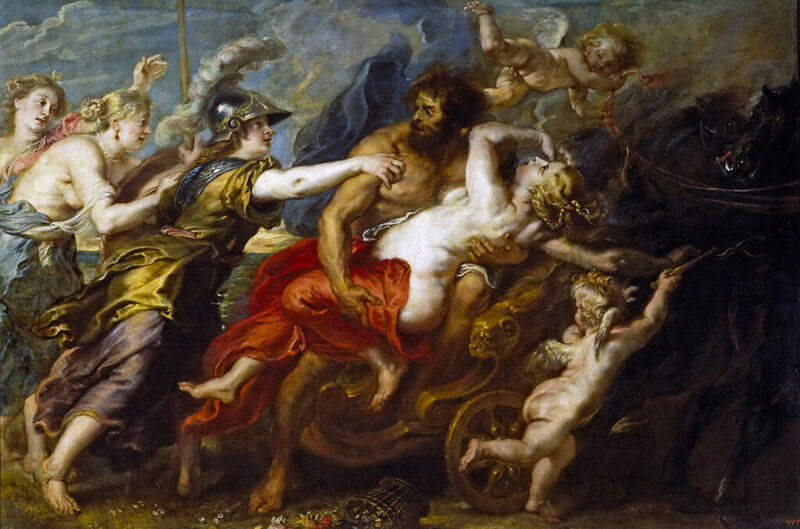 She learns Zeus (the King of Gods) cut a deal with Hades to allow the marriage. As the conflict brewed, everything froze on Earth and all crops died, because for the Goddess of Harvest, freezing stuff up is easy to do. Just snap your fingers. So that’s why we have winter — a season born from a mother’s grief over her stolen Persephone. So under pressure from the people — Democracy! – and Demeter’s protests around Mount Olympus (“What do we want? Persephone! When do we want her? Like yesterday, it’s getting cold!”), Zeus sighed. By this time, Persephone was quite sickly with the weight of her Crown of Thorns and because she was not eating anything at Hell’s Cafeteria. Hades pondered all. “Okay. Look, you can have her back.” But Hades does a trick. He gives the too-hungry Persephone a magic pomegranate and releases her to Earth. She comes home. Demeter is ecstatic. The crops are allowed to grow again. This is why we have spring! That’s why she’s also known as the Goddess of Spring. But upon seeing the red fruit juices from the magic pomegrante on Persephone, Demeter’s heart sinks. “Oh no, my heart is sinking.” The magic on the fruit requires that Persephone return to the Underworld every year. That’s why the we have a cycle of seasons.